I started another pair of monkey socks this time in Wollmeise-the colorway being Suzanne that my friend pquetsch sent me from a blog contest. The picture doesn't really do the color justice but once I finish both (I'm halfway through the 1st) Ill make sure to show them off in grand style. 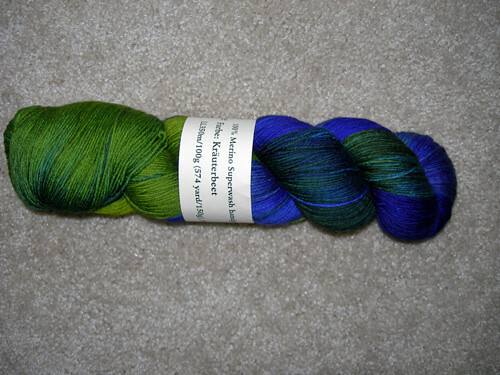 And speaking of Wollmeise, Sheri from The Loopy Ewe sent me a skein of Krauterbeet For being the 1500th post on Ravelry.com. :) The woman is beyond Generous so go buy yarn from her. She rocks. It was on my wish list on her website and that was the one she sent me! The purple and green is gorgeous! And then because I'm a sucker and such I plunked down $60.00 for a skein of chasmere from Noro that i'll make a scarf out of...Never you mind that we are out of scarf weather. Sigh. but it's pretty. There isn't great lighting right now in the apartment so all the pictures are less than desirable. But I'm sure I'll manage. Have a great day! Spring comes then two days later? BAM! Hit with 83 degree weather. I finished socks! I finished a Project! My new namaste clutch is HUGE as well as my two skeins of Wollmeise I stayed up all night for. :) See? huge! But I love it. And the hubby got home SUPER EARLY from work today so we are off to spend some quality time together! Yea! But it's just our brand of love. :D :D Here are the socks I've been working on-I'm about to turn the heel on the 2nd. I've done some knitting. But not a whole lot. I have pictures to share, but I've not up-loaded them from my camera and edited them. Matthew and I were supposed to go on a Marriage Retreat via the marines but we got DENIED because it was FULL-he turned it in to late. Never mind the fact that they wouldn't let him turn in the info all last week and when he'd manage to GET to the freaking office, NO ONE WAS THERE!!!! So we don't get to go and we are probably one of the ones who actually need it. There are a few nice people in the military but honest to god, the f-ing assholes out number them. I've knit one sock in plain st-st and am just so underwhelmed about doing the 2nd one. My secret of the stole still needs me to rip back 8 rows but I can't really face that right now. I've had no movotiation to do anything creative lately and it's bumming me out. And his stupid cat just horked up two hairballs on my *$#^%(&^@* white carpet. My cat snores in his sleep. HAHAHAHAHAHHA. rock. P.S. My living room is full of lumber. Mathew decided it would be better to build cat perches than buy them. Thanks for all the wonderful comments! The baskets have been *such* alife saver (as well as the hutch! I LOOOOOVE IT!) in terms of keeping things organized and easy to clean. I got those at TJ Maxx (feel free to steal the idea). The bathroom hutch is from bed Bath and beyond(Kind of like THIS ONE but the legs on mine are knobbed).